Here's a loop tour of Southern New England by car that starts in Boston, but which can actually be started anywhere along the loop. This 7- to 10-day loop tour starts in Boston and takes you to the highlights of southern New England: Massachusetts, Connecticut and Rhode Island. If you're starting this tour from New York City, begin at Day 4, heading east along the Connecticut shoreline, and end on Day 3, heading south back to New York. Here are tips on renting a car in New England. Drive west from Boston on the Massachusetts Turnpike (I-90) for 90 minutes to Sturbridge for a visit to Old Sturbridge Village. Stay in the area, or continue westward to Amherst or Northampton. Visit Old Deerfield if you have extra time. Head for the Berkshire Hills. Enjoy a picnic, visit the Norman Rockwell Museum in Stockbridge, and Chesterwood, the studio of sculptor Daniel Chester French, or perhaps the Hancock Shaker Village, and take in an evening performance at Tanglewood, Jacob's Pillow Dance Festival, the Berkshire Theater Festival, or some other cultural venue. Drive south to Connecticut's Lake Waramaug and Litchfield for a look at this pristine 18th-century town and nearby vineyards. Continue south down the Naugatuck River Valley along CT Route 8 to Derby, then east on CT Route 34 to New Haven for dinner. Explore Yale University and its excellent museums in the morning, and drive east along I-95 to the delightful towns at the mouth of the Connecticut River: Essex, Ivoryton, and Old Lyme. Choose a place for lunch. Continue to New London or Mystic for the night. (If you're starting your tour from New York City, this would be Day 1). Visit Mystic Seaport Museum or, if you prefer, the US Coast Guard Academy and Navy Submarine Base. Spend the night in Mystic, Stonington, or the casinos (Foxwoods and Mohegan Sun). Drive to Newport RI to tour the fabulous mansions along Bellevue Avenue, ride bicycles along Ocean Drive, amble along Cliff Walk, and enjoy an excellent seafood dinner. 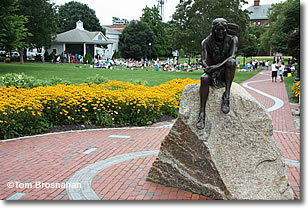 If time is short, head for Plymouth to view Plymouth Rock and visit Plimoth Plantation before heading back to Boston. Enjoy Cape Cod: tour the Cape Cod National Seashore, lunch on fried clams and french fries, take a swim. If you're in the mood for a circus atmosphere, drive out to the tip for a look at Provincetown. Or, from Wood's Hole or Hyannis, take a day-trip or an overnight excursion to Martha's Vineyard or Nantucket (going by plane will save time). Village Green & statue of Iyannough, Hyannis, Cape Cod MA. 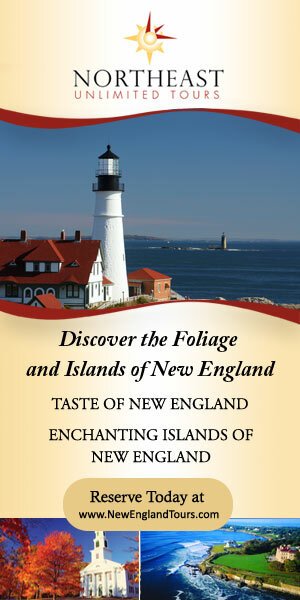 Continue your explorations of Cape Cod, Martha's Vineyard or Nantucket. Head back to Boston, stopping at Plymouth for a look at Plymouth Rock, the Mayflower II, and a few hours at Plimoth Plantation. 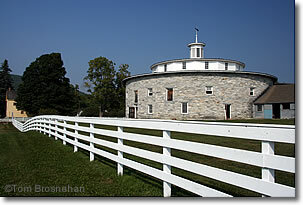 The round barn at Hancock Shaker Village, Pittsfield MA.